It is possible that a Saxon chapel was originally on the site of the present church, but first mention of it was in 1135. It was then that it was given by Hugh de Malbanc, 2nd Baron of Nantwich, with St. Mary’s, Acton, of which it was a part, to Combermere Abbey. The chapel was replaced by the first church, built in 1541 by John Minshull, who was also the first rector. 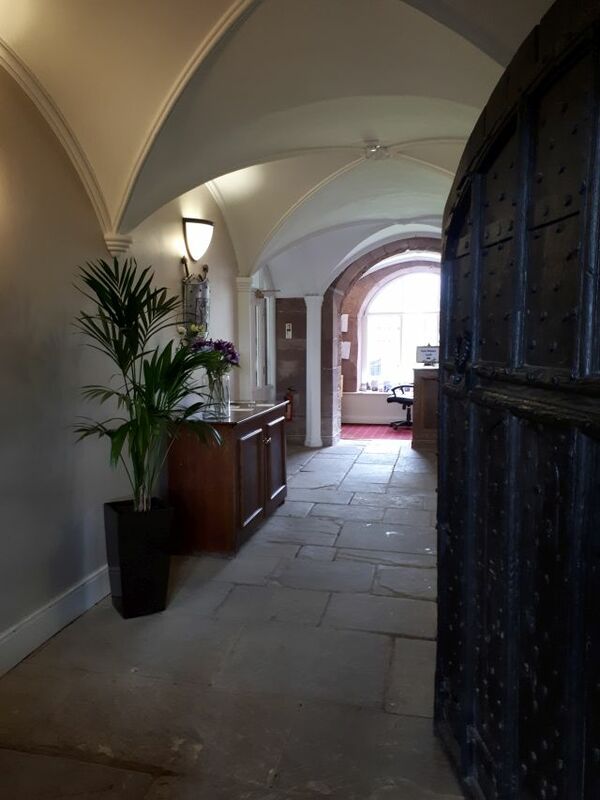 This was a timber ‘black and white’ construction which in 1572 contained at least 50 coats of arms of the local nobility, either depicted in the stained glass windows or painted on the walls. The Minshull family ceased to be Lords of the manor in 1654 when the heiress, Elizabeth Minshull married Thomas Cholmondeley of Vale Royal. Minshull Hall was tenanted out and Vale Royal Abbey, built from the ruins of its Medieval name sake became the manorial home. 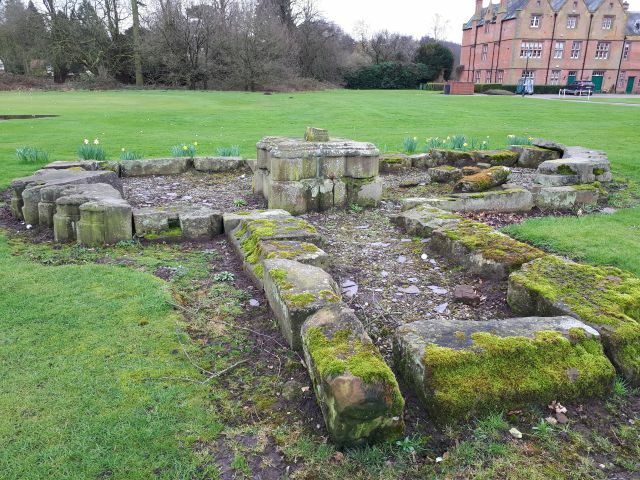 Remnants of the Abbey were discovered incorporated into the later building during renovations at the end of the twentieth century. 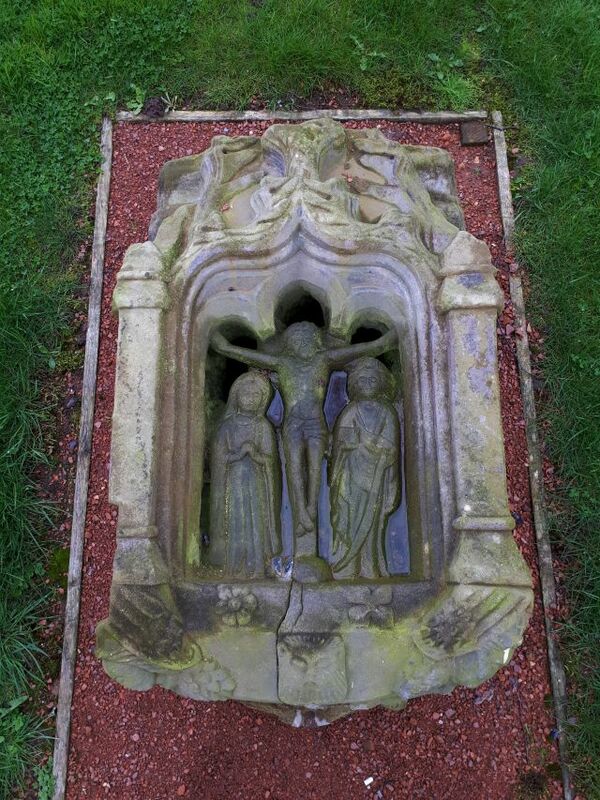 Prior to that only the Nun’s grave had existed as a garden feature on the site of the high altar. While the pieces of this grave still exist they are from three different periods and are now once more separated. The Nun’s Grave and the site of the High Alter. The head of a medieval cross, once the Nun’s Grave top piece. The entrance to Vale Royal Abbey formally parts of the ‘South & West Abbey Ranges’. In 1667 a storm damaged St. Bart’s roof and the west wall. At the beginning of the following century the tower partially collapsed and it was rebuilt in 1702, by an appeal to Queen Anne’s Bounty. The rest of the church was still in a dangerous condition and it was completely rebuilt by 1720. The bells were added in 1717 and a clock was placed in the tower in 1722. A junior branch of the Brookes family of Norton Priory began to purchase the Minshull estate from 1790, becoming Lords of the manor at the turn of the century. There were fires in the church in 1798 and 1804 which led to a restoration in 1861, but there were further fires in 1874 and 1885. In 1891 there was another restoration of the church, by Walter Boden. The Brookes family sold off the village from 1920 to 1923. Sadly the internal alterations of 1861 had weakened the structure of the church and in 2000 it was declared to be unsafe. A major restoration of the church took place from 2002 to 2012, which included the roof, tower roof, bells, clock and interior. The church now has a toilet, kitchenette and meeting space. 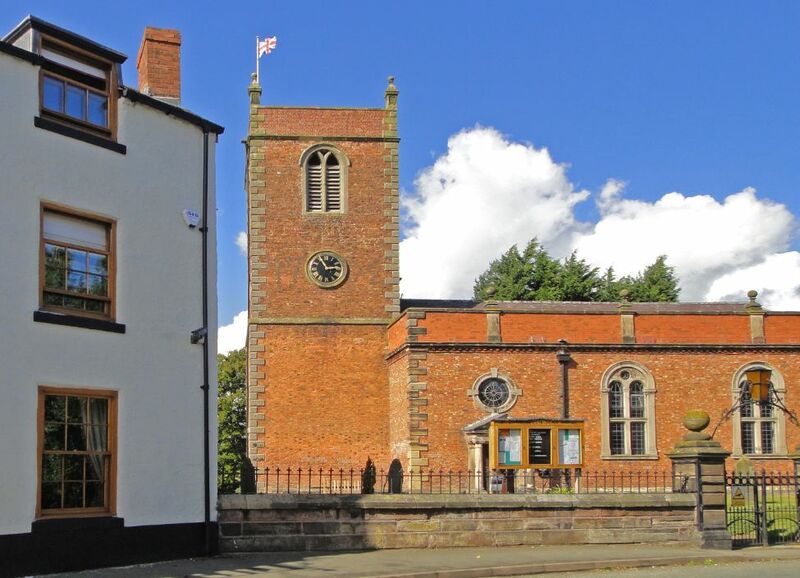 The church is in Bollingbroke style, constructed of brick with stone dressings, but it is believed that the stone pillars inside the church are from the previous building of 1541. The stone quoins and finials were made of stone from a quarry at Manley near Macclesfield. The plan of the church consists of a three-bay nave with a choir and an apse at the east end. The tower, in neoclassical style, is at the west end. The date 1702 is picked out in glazed bricks on the tower, either side of the clock face. Above there are louvred two-light belfry windows. At the top of the tower is an ogee cornice and a parapet with ball-topped finials at the corners. Over the porch and north doors are bull’s eye windows. The nave and chancel windows are round headed. Above the nave is a cornice and a solid red brick parapet, interrupted by ball-topped pilasters over each window. Externally at the foot of the tower there is the Wade tomb and on the east wall is a 17th-century marble armorial memorial for Thomas Minshull. The georgian sundial is contemporary with the church. At the west end of the church is a gallery, dating from 1861 and in the body of the church are box pews. There are memorials to the Brooke family on the north wall and there is a panel containing the arms of the Cholmondeley’s, painted by one of the Randle Holme family, in the south east corner. Members of the Cholmondeley family who were buried in a vault are commemorated on a tablet by the organ. The font, dated 1717, is in classical style, painted cream and is by John Morfitt. In the apse, on each side of the east window are panels containing the Ten Commandments and prayers. The marble war memorials date from about 1920 and 1946. The ring is of six bells. Four of these are by Rudhall of Gloucester, three being dated 1717 and the fourth 1768. The other two bells, dated 1982 and 1983, are by Petit & Fritsen. A cracked bell of 1717 is in the south west corner of the nave. The parish registers date from 1561 and churchwardens’ accounts from 1623. The gates and gate piers are listed at Grade II. They consist of cast iron gates hung on sandstone piers. The churchyard contains the war grave of a marine of World War I.